Four�persons were killed and�32 injured when a powerful blast ripped apart a BEST bus in Ghatkopar in northern Mumbai on Monday night. Two persons died on the spot. Quoting the police, a PTI report said the blast was the result of a bomb, planted underneath a seat of the bus (route number 340), exploding. Police also said a dog squad and a bomb detection team had been rushed to the spot. 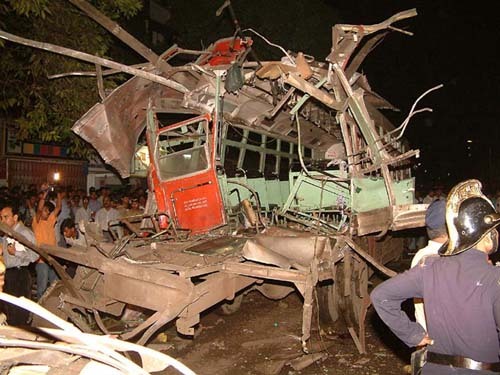 The rear part of the bus has taken the full impact of the blast, which occurred around 2115 IST. The injured have been admitted to the nearby Rajawadi Hospital, Sion Hospital and some private hospitals. The blast occurred when the bus was near a telephone exchange on the busy Lal Bahadur Shastri�Marg. Another bus nearby,�two motorbike, shops and buildings in the vicinity were affected by the impact of the blast. Even some shops, whose shutters were down, showed signs of having borne the impact of the blast. A shopkeeper nearby, who was�injured by debris, told rediff.com he saw a woman in an autorickshaw following the bus being thrown about 10ft in the air by the impact of the blast. He said she died instantly. Another witness, Pradeep Bhavnani who was driving home in his car from his shop in Bandra, told rediff.com that people in the vicinity had been momentarily stunned and he saw debris flying all over the place. He said a man who was immediately behind the bus on a motorbike�was killed�on the spot. Member of Parliament Kirit Somaiyya told Zee News that it appeared to be the biggest among the recent blasts in the city. He said the roof of the bus had been completely blown off, while three autorickshaws in the vicinity had been severely damaged�owing to the impact of the blast. One of the autorickshaw drivers, it was later learnt,�succumbed to his injuries. 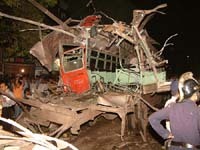 The bus, originating in Andheri, was near the last stop when the blast occurred, Somaiyya said, indicating that several of the passengers had got down reducing the number of casualties. Mumbai Police Commissioner R S Sharma told Zee News that searches have been launched in the city and a statewide�alert has been sounded. Chief Minister Sushilkumar Shinde announced Rs 50,000 ex-gratia for those with serious injuries and Rs 10,000 for those with less minor injuries. At Rajawadi Hospital, Shiv Sainiks gheraoed Minister of State for Home Kripashankar Singh protesting against the government's failure in handling the law and order situation. He claimed to have warned the police�about terrorist groups�being active in Ghatkopar and added that the state government has taken the blast as a challenge and 'will definitely arrest the terrorists'. Joint Commissioner of Police Javed Ahmed said the explosion was similar to the one that had taken place in a BEST bus in Ghatkopar in December 2002 leaving two persons dead. This is the fourth bomb blast in Mumbai in the past seven months. 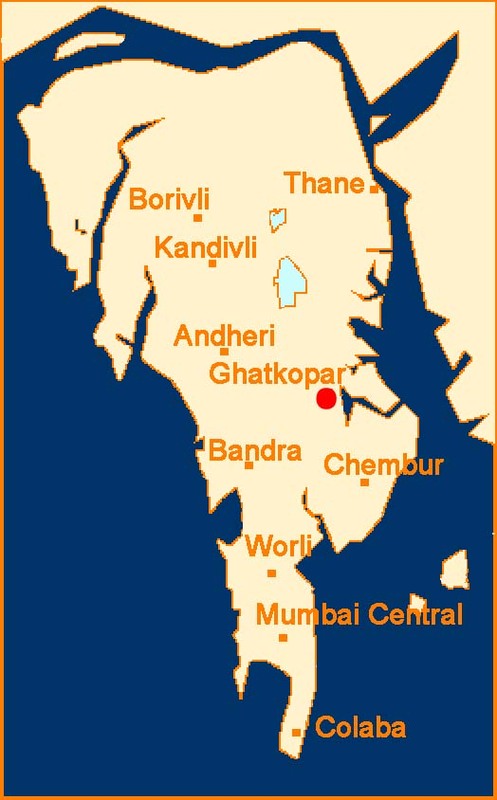 The first in the series had occurred in Ghatkopar on December 6, 2002 killing two persons. The second took place on January 28, 2003 in Vile Parle, killing one person and injuring 25. The third, a much bigger blast, took place on March 14, 2003 in a local train at the Mulund Railway Station, and claimed 10 lives. A formal announcement is expected on Tuesday, party sources said. The Vishwa Hindu Parishad is expected to�support the bandh call.